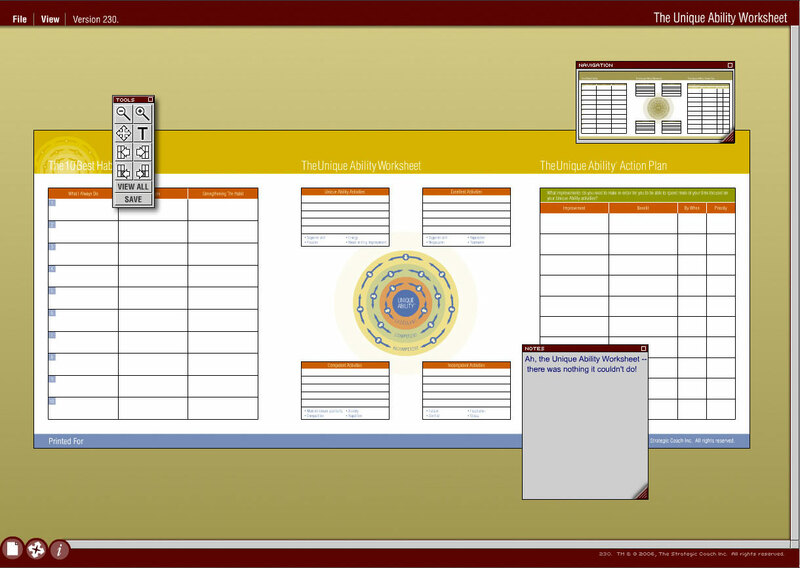 Client: The Strategic Coach Inc. Reproducing the print world in an interactive medium. The Strategic Coach Inc., a Toronto-based entrepreneurial consulting and training company, eschews technology. Or rather, they love technology, but urge their clients to work with pen and paper in their workshops, freeing their minds from the complexities that technology can often bring. With a large catalog of beautifully printed paper forms, and a client base used to the familiar layouts, a demo was commissioned to reproduce printed documents exactly in the interactive medium. Above: a fully scaleable, interactive, animated interface capable of zooming, scrolling, and jumping from field to field and area to area. And it looks exactly like the real thing. With an authenticated backend, users can log in to their accounts, load previous entries and save new ones, and print PDFs of completed forms. As users enter in their data, the system automatically navigates to the next input area, making the process as simple as possible. Users can also navigate with scroll bars, or through the tool palette or View menu, or simply by tabbing through the fields, while the system does all the hard work of shifting the form around. Floating tool and note palettes facilitate ease of use. The scaleable navigation palette allows instant navigation to any area, and the entire work area is scaleable on-the-fly to match any monitor size. This entry was posted on Thursday, October 27th, 2011 at 6:29 pm. It is filed under Visual Application Development and tagged with ActionScript 2.0, Adobe Flash 8, Adobe Illustrator, XML. You can follow any responses to this entry through the RSS 2.0 feed.